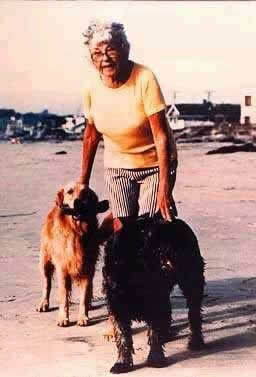 Helen Whittier Woodward, the Center’s founder, was committed to making the world a better place for people and animals. In 1972, she and a group of friends envisioned a facility that would encompass comprehensive animal care and public education programs. Through her support and leadership, she guided the facility into one of the area’s most highly regarded animal and human service programs. The California native who maintained a home in Del Mar for 40 years, Helen Woodward dedicated her life to a number of charities, including those for animals, blind people, and the elderly. Picture this. There actually was a cow in the backyard of the Los Angeles home where Helen Woodward was born in 1907. Her father, Max Whittier, a farm boy from Maine, became a pioneer in the California oil industry. While looking for water, Max discovered oil. This led to the creation of the “Rodeo Land and Water Company” and eventually the community of Beverly Hills. From their home on Sunset Boulevard, Helen and her three brothers looked across the bean fields that stretched all the way to Wilshire Boulevard. Helen’s mother died when she was 14 years old. When her father died several years later, her brothers took over the family business and the responsibility of raising Helen. She attended USC for a year before marrying Hoke Woodward. Hoke’s family were neighbors on Alvarado Street. He and his brother drank fresh cow’s milk after school with Helen and her brothers. Helen, Hoke, and their daughters, Winifred (Win) and Marcia, always had dogs in the house (usually golden retrievers). Helen loved the outdoors. She said, “The days that the sun doesn’t shine don’t count.” Her happiest days were spent on the Del Mar beaches with her dogs. She loved dogs so much that the furniture in her home was covered in plastic, so that the dogs could lie anywhere. When friends came for dinner, there would often be no place to sit because the dogs took all the available seating. Win says that she believes her mother preferred dogs to people for their unconditional love and loyalty. Unfortunately, many of the structures that house Helen Woodward Animal Center today were not built until after Helen’s death in 1983 at the age of 79, so she was not able to see her final dream realized. The Center was renamed in 1986 to honor her memory. We know that Helen would be pleased if she could see the miracles that take place at Helen Woodward Animal Center today. Each time we see a disabled child on a therapy horse, a group of scouts learning about responsible pet ownership, or a family walking out the door with its new dog or cat, we thank this amazing lady whose vision and love for animals made it all possible. Special thanks to Win Rhodes for the biographical information on her mother, Helen Woodward.